Natalie Portman stars as a pop music icon who survived a school shooting on Staten Island. 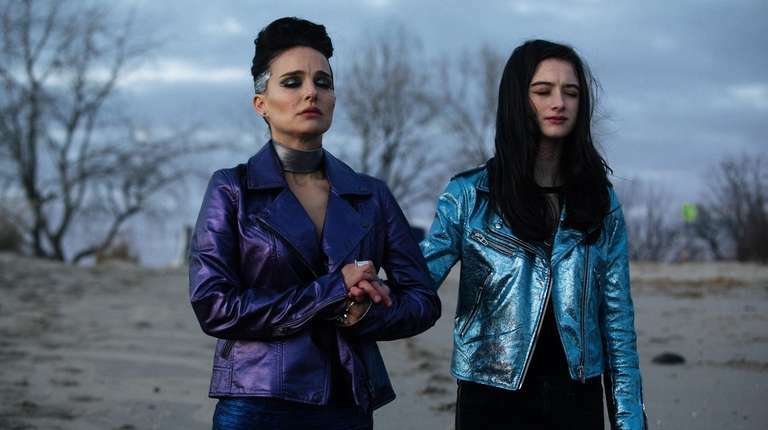 “Vox Lux” is a discomfiting, trying movie that also has the confidence to establish its particular perspective and see it through to the end. In the second film directed by erstwhile actor Brady Corbet, which plays like a much darker cousin to “A Star Is Born,” Natalie Portman and Raffey Cassidy star as a pop megastar named Celeste whose career launches and promptly takes off after she survives being shot in a mass school shooting on Staten Island. The movie opens with that horror, vividly rendered with such precision that it’s hard to stomach. From there, it proceeds to an audacious exploration of the nature of fame in America, narrated by Willem Dafoe and permeated with a host of ominous and foreboding touches. “Vox Lux” has the courage of its convictions. There is no hesitating in the ways Corbet, who also wrote the screenplay, directly connects Celeste’s success with her traumatic experience and the picture is positively scathing in its indictment of the hangers-on and vampiric business types who power her to fame and fortune but leave her stricken with an unfathomably greater degree of inner turmoil. Cassidy plays Celeste in the first half of the movie, which begins in 1999, before Portman takes over in 2017 and Cassidy shifts to playing her daughter, Albertine. Their collective portrait is a rich study of a person who has been subsumed by her public image to the point that there’s nothing left but anger, pain and relentless cynicism. “All that matters is that you have an angle,” she says. The world exploits her and she dishes it right back.